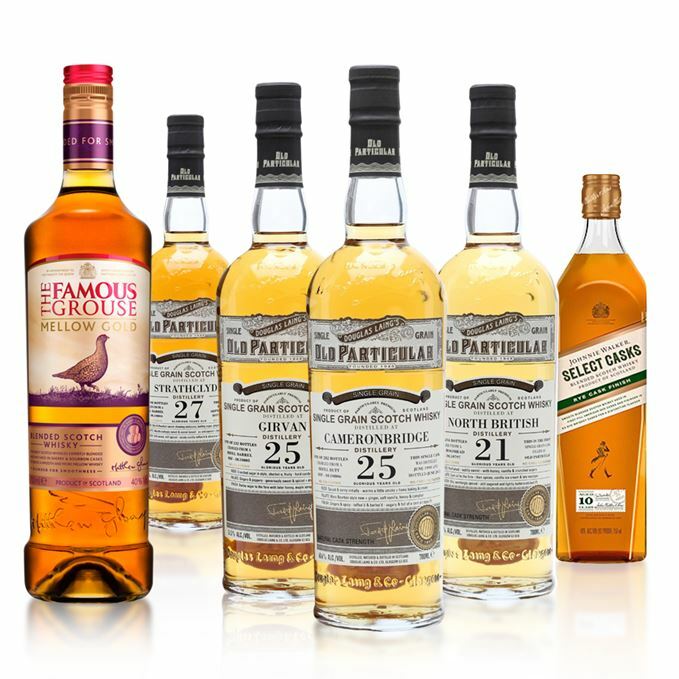 This week's whiskies include a new series of single grains from Douglas Laing, plus two blends: the latest Famous Grouse bottling and an off-the-wall offering from Johnnie Walker. Prickly and lightly spicy, with an underpinning of vanilla and hot sawdust. In time, that spiciness becomes more peppery, sitting alongside sweet pear and melon rind. Water dries things out, showing wheat chaff. Just a little musty. There’s some American oak-style spiciness, but this remains distillate- rather than cask-driven. Highly focused and hot – it needs water, which sorts things by fleshing out the mid-palate and revealing some fondant cream. Still really tight on the back palate, where all the elements seem to be forced together. The finish is the let-down here. A boat failing to sail between Scylla and Charybdis. Big and buttery, with masses of coconut cream and some fresh Moscatel grapes. It shows a light floral aspect as well. The cask has helped here, though it doesn’t dominate. A little rummy touch that brings to mind banana split. When water is added, the flowers are revealed as carnations. Very effusive and floral with an added note of Dolly Mixtures. Light, fresh and clean, with balancing acidity (rather than sharpness). Water diminishes the effect, but the mid-palate is still fairly perky. A café on the Firth of Clyde in summer. A clean, sweet and slightly hot mix of flowers and the weight typical of the distillery. When you add water, there’s a little of the North British sulphur which adds a darker edge to proceedings, and an aroma akin to wet slates. Good, textured weight. This is bold for a grain with good structure and a light pepperiness on the back palate. With water, things become oilier with a suggestion of green rhubarb. Excellent distillery character. Just a little more cask action would have helped. Late August. Edinburgh. Rain and pigeons on the roof. Sun breaking over Arthur’s Seat. Although light, precise and fresh, this grain is also quite angular, which adds a bracing edge to things. As it opens in the glass there’s subtle, soft orchard fruits and a little charred note. With water, a purr of cream. More rounded than the nose suggests, with some scented notes which become more toasty in time. By the time it’s reached the mid-palate, it is doffing its bonnet towards Bourbon. Water dulls its edge. Very decent and worth checking out. Listening to Hank Williams on Glasgow Green. Softly Sherried notes come across immediately. Light Seville orange, sultana, Madeira cake. Then comes green bracken and gently dried fruits before some light nuttiness, smooshed raspberries, blackcurrants and Juicy Fruit chewing gum. Rounded, clean and quite fat in the mouth. An immediate nutmeg-like spiciness is picked up, while the mid-palate has a little bite which is needed to disrupt (and balance) the otherwise gentle flow. Water brings out a little supple tannin, a hint of liquorice sweetness and dark fruits. All very well-balanced. A Grouse with more Sherry casks in the mix and a really good new addition to the range. Scored within its competitive set. After dinner. With ginger ale. The sour spice of rye comes across on the nose with some baking products and sweet fruits. In time, a little green anise and apple note. Slightly hot when neat, but sweet. All very pleasant and non-threatening and very North American in its make-up. Water shows a little more oak. As with the nose, the start is spicy, sweet and by the mid-palate all the elements are in balance – fruit syrups, some fat grain and a slightly bitter twang from the rye. All very well put together. Spices and oak come through. Ok, here’s the deal. This cannot be faulted technically. This is great blending, but if given blind I’d say it was a Canadian rye. It’s certainly not Scotch. More damningly, it’s definitely not Walker. While it would get top marks for quality, that aspect cannot be ignored and it is marked accordingly. Listening to ersatz Scottish country singer Sidney Devine’s greatest hits (Did he have any? – Ed). Batch 6 18/09/2015 Three flavour-named blended malts; two singles from Burn Stewart; one delightful NAS Glenfarclas. Batch 4 04/09/2015 Independents dominate this collection of single malts, with an old Littlemill to the fore.